Fizzy, boozy and refreshing, this Strawberry Gin Fizz has it all! If you had a long weekend and need something to chill you out, do yourself a favor and mix up this delicious refreshing drink. If you live in the UK, you’ll probably know better than me that tomorrow is World Gin Day. And if you weren’t aware of this, well you now have a great excuse to celebrate with a lovely, boozy cocktail (or many). I cannot think of a better way to celebrate than a vibrant fizzy cocktail. 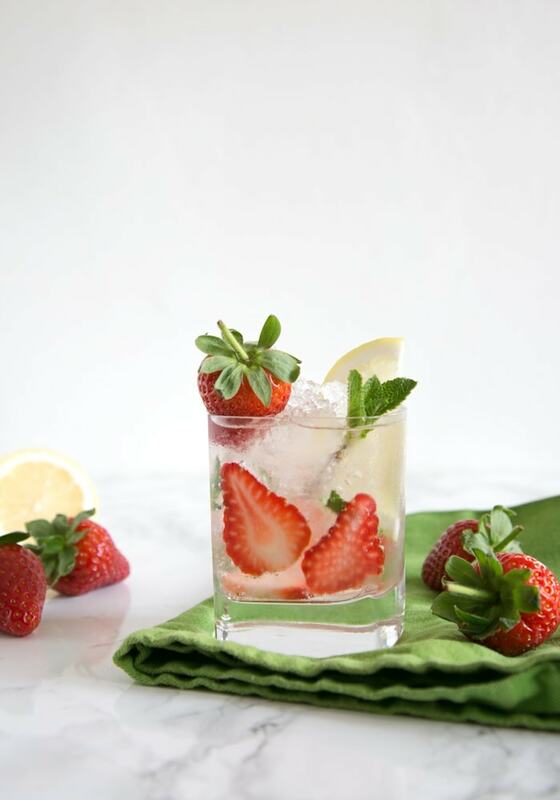 I’ve combined some of my favorite cocktail ingredients to make this refreshing summer drink recipe – lemon, gin and tonic water, with seasonal strawberries as the guest star. 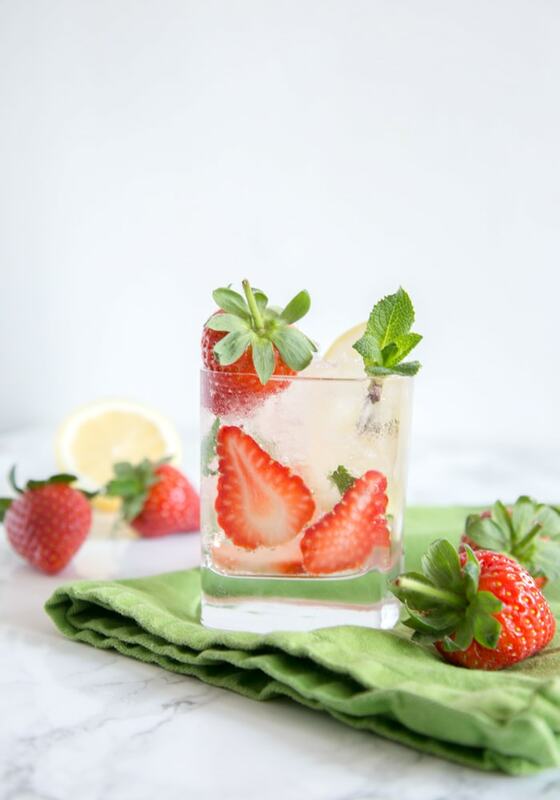 Ready in less than a blink, and with only simple ingredients required, this Strawberry Gin Fizz will probably become your new favorite summer drink. It’s just so simple to mix together, lightly refreshing and boozy enough to make you giggle. This Strawberry Gin Fizz is the perfect drink to enjoy over a warm summer weekend, even better if you pair it with this incredible No-Bake Gin Lemon Cheesecake. I mean, World Gin Day doesn’t possibly get better than this! And if you’re looking for more boozy drinks, make sure to check out my cocktail section – There are some incredible cocktails ( watermelon margarita, anyone?) waiting for you! Fizzy, boozy and refreshing, this Strawberry Gin Fizz has it all! Ready in just 5 minutes with simple ingredients, it's the perfect drink to enjoy all summer long! In a glass, squeeze the juice of the lemon wedge. Fill the glass with ice and add the sliced strawberries. Pour in the gin. 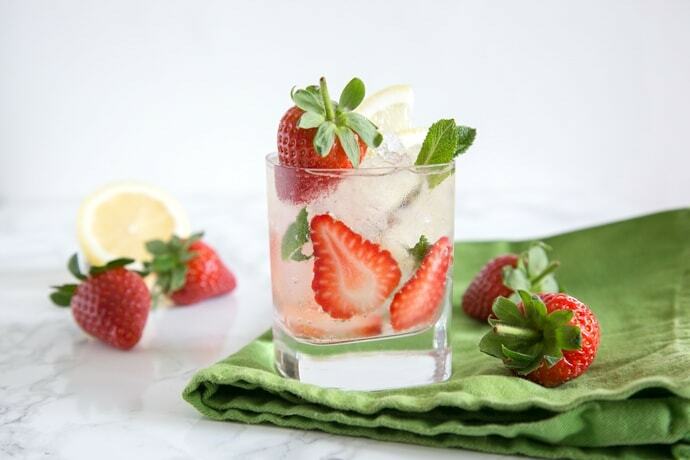 Top with tonic water, garnish with the remaining strawberry and a sprig of mint. Enjoy! This is such a refreshing idea for summer!